The Raiders walked through the season’s first half, winning their first seven games before running into Red Deer. After falling to the Rebels, the Raiders then pieced together a 19-game winning streak before coming up short against last year’s WHL Champions in the Swift Current Broncos. Despite the 40-point gap between the Rebels and Raiders, their four-game season series produced four one-goal games, including a win for the Rebels and another game in which the Raiders needed to go to the shootout before finding the win column. It promises to be an interesting matchup for a Prince Albert squad that was challenged to keep its focus in the second half of the season after such a successful start. Up front, Prince Albert forward Brett Leason, who was passed over in the past two NHL drafts, has something to prove and looks to continue to be a force in the postseason. The 19-year-old has had a breakthrough campaign and should be an early pick at the NHL draft in June. Between the pipes, Toronto Maple Leafs prospect Ian Scott has been solid, including a three-game stretch in March in which he put up a trio of perfect games against the Broncos. Two East Division foes will battle it out in the first round when Saskatchewan-based rivals in the Blades and Warriors face off. The Blades, in particular, are ready to make some noise in the postseason after qualifying for the first time since 2012-13. The series promises to showcase some of the league’s top young talent, including Blades forward Kirby Dach, a projected early pick in the NHL draft this summer who will have his latest opportunity to put on his best performance for eager talent evaluators. There’s also Moose Jaw left-wing Brayden Tracey, whose 81 points finished first among all CHL freshmen. Between the pipes, Warriors netminder Adam Evanoff is coming off one of his top performances of the season after he stopped 52 shots over two games to come away with two wins and Eli Wilson Goaltending Goaltender of the Week recognition. Also impressing for Moose Jaw is defenceman Josh Brook, a Montreal Canadiens prospect who alongside Saskatoon’s Dawson Davidson ranks first among all WHL blue-liners with 75 points on the season. The Oil Kings were unbeaten in regulation through six regular season contests against the Tigers and hope their quarter-final meetup can be dealt with in similar fashion. Edmonton is led by a host of key performers including captain Trey Fix-Wolansky, who recently inked an entry-level contract with the Columbus Blue Jackets. After finishing last year with 89 points, the overage forward set a new career high this season with a 102-point performance, good for fourth in league scoring, while his 65 assists sat second to only Moose Jaw’s Justin Almeida. On the blue line, the Oil Kings have a budding star in defenceman Matthew Robertson, a top prospect who looks to be a first-round selection at the NHL draft come June. Edmonton has had little difficulty finding offense this season as its scoring output ranks fifth league-wide, but the squad will have their work cut out for them in facing Tigers netminder Mads Sogaard, who has impressed in his first season in North America. The Danish goaltender, who is on the radar of NHL scouts, twice took home CHL Goaltender of the Week honours this season. Two Alberta rivals will go head-to-head in this Eastern Conference showdown. While the Hurricanes took the lion’s share of the regular season series, look for the Hitmen to seek opportunities on the man advantage, where the club’s second-ranked powerplay could prove to be a chore for Lethbridge’s reeling penalty-kill unit. Leading that charge is Hitmen forward and Phoenix, Ariz., native Mark Kastelic, whose 24 goals on the man advantage rank first in the WHL. In all, he’s scored 47 times the season, which trails only Portland’s Joachim Blichfeld and Moose Jaw’s Tristin Langan, both with 53, for top spot league-wide. Still, the Hurricanes will bring offense of their own in leading scorer Nick Henry, who was acquired from the Regina Pats in late November, and who enters the postseason riding a 12-game point streak in which he has collected eight goals and 12 assists. There’s also budding centre Dylan Cozens, a projected early pick in this summer’s NHL draft who will be looking to make another deep playoff run after advancing to the Conference Finals with Lethbridge a year ago. Despite the 31-point difference that separates the two squads, the Giants and Thunderbirds split their season series, though that outcome won’t be possible in the playoffs. The Giants bring a balanced lineup offensively, plus a dynamic duo between the pipes in draft-eligible netminder Trent Miner as well as David Tendeck, a sixth-round selection by the Arizona Coyotes a year ago. Both netminders finished the season with 24 wins a piece and give head coach Michael Dyck two worthy options to choose from. The two keepers also play behind a dynamic defenceman in Bowen Byram. A projected top pick in the 2019 NHL Draft is no stranger to creating offense from the back end, as his 71 points on the season rank second among all WHL defenders. For the Thunderbirds, the squad has a promising defenceman of their own in Alberta native Jake Lee. Better known for his defensive awareness, the budding blue-liner still finished the season with a career-high 24 points and will continue to draw the attention of scouts as the NHL draft draws near. A playoff appearance came right down to the wire for the Blazers, who defeated their British Columbia rival Kelowna Rockets to advance to the postseason and draw a date with the Victoria Royals. In all, it marks Kamloops’ third playoff appearance in the past four seasons. In facing the Royals, the Blazers draw an opponent who has also had difficulty in producing offense, as both clubs rank in the bottom half of the WHL. In fact, no player on the Royals cracked the 50-point plateau this season, as the team is led by a 49-point output from forward Kaid Oliver. That could mean fans are set for a goaltending battle between the Blazers’ Dylan Ferguson, who made a brief appearance with the Vegas Golden Knights a year ago, and who should be well rested after he did not play in the tie-breaker game against Kelowna, and Royals overage netminder Griffen Outhouse, who continued to put up solid numbers in his fourth WHL season. Facing off nine times in the regular season, the Royals took the series with five wins, though Kamloops came on toward the end with three-straight victories. Silvertips netminder Dustin Wolf has been a wall in 2018-19, coming away with a 41-win season in his second year in the WHL. That included seven shutouts and an outstanding .936 save percentage to go with three-time recognition as the CHL Goaltender of the Week. The Californian has undoubtedly put himself on the radar for this summer’s NHL draft. Wolf’s ability to shut things down between the pipes has held up a Silvertips squad that is only average offensively, with Minnesota Wild prospect Connor Dewar one of only two players on the team to score more than 50 points this season. Still, it was enough to help Everett clinch its third-straight U.S. Division title and fourth in the past five campaigns. 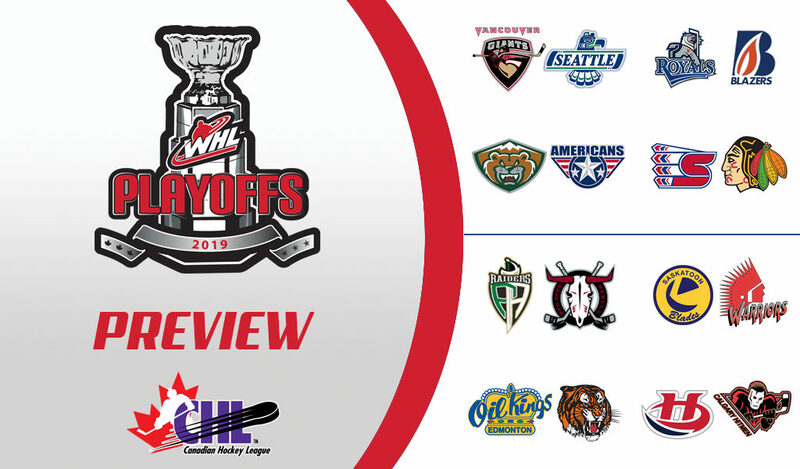 Meanwhile, despite a 25-point difference, the Americans could prove to be tough competition for the Silvertips as several key players could ultimately be big contributors in the series. Chief among them is netminder Beck Warm, whose 61 games this season tied Wolf for the most in the WHL. There is also 2019 NHL Draft prospect Sasha Mutala, who reached career highs in goals, assists, and points this season. The Chiefs will have their hands full when it comes to shutting down Winterhawks left-wing Joachim Blichfeld. The overage forward and San Jose Sharks draft pick was a challenge for seemingly all opponents this year, as he finished the 2018-19 campaign with a league-leading 53 goals (tied with Moose Jaw’s Tristin Langan) while also sitting atop the league with 114 points. The Danish forward brings a dynamic game, so minimizing his production will be key to a series win for Spokane. Though Blichfeld ran away with his team’s scoring lead, he’s not the only Winterhawks skater capable of finding the back of the net. There’s also Vegas Golden Knights up-and-comer Cody Glass, who finished with 69 points in 38 games, good for 1.82 points per game, which ranked first league-wide. As for the Chiefs, the team brings a few critical performers to the table, including defenceman Ty Smith, who was a first-round selection by the New Jersey Devils a year ago and who this season finished the year with 69 points, just six shy of the league lead among WHL defencemen.